Digital NEST creates prosperity in the predominantly Latinx, historically working class and immigrant communities in rural California that have typically been left out—or locked out—of the 21st-century digital economy. Digital NEST helps create prosperity through three synergizing strategies: 1) Helping Latinx youth ages 14-24 become “career-ready” and “career-competitive” for tech-involved jobs, 2) Paying youth to provide web development and video production services to help local businesses grow, and 3) Connecting their career-competitive youth with local and regional employers to fill those employers’ critical workforce needs. Digital NEST knows that their kids deserve the very best to nurture their talents, wisdom, and passions so they built their own thriving center for technology and empowerment that prepares young people to prosper in the workforce. 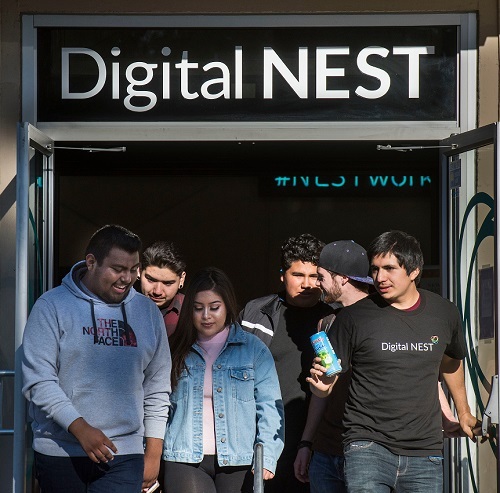 Digital NEST spins a web of connection and opportunity across the entire community. The idea for Digital NEST was formed one night when Jacob saw a young woman sitting outside a locked building working on her laptop. Curious about what she was doing sitting outside in the cold he approached her and asked. She told him she was a student at the college but had no access to the internet at home. “I come here for Wi-Fi so I can complete my homework assignments,” she explained. It was all too common to see young people huddling outside locked buildings in rural agricultural communities trying to complete schoolwork, apply for jobs, and access the social and networking opportunities enjoyed by their connected peers. The need was clear: our youths need a safe place; a place to learn the skills that prepare them for the 21st Century workforce. They need a place that connects them to free Internet and the latest technology. They need teachers, mentors, and professionals to connect them to opportunities. They need a community that values who they are and the potential they represent. And they need a place that will teach, nurture, and guide them to become the very best version of themselves. And so, Digital NEST was born. Jacob is a Latino leader at the forefront of a critical issue: ending the disparities and confronting the biases that bar Latinx Californians in rural/agricultural communities from economic opportunity. He is pioneering a model that helps rural youths “upskill,” earn credentials, learn entrepreneurship and enter the technology workforce. 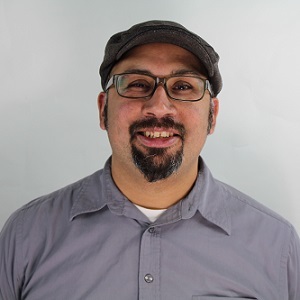 He employs culturally competent strategies to connect newly-trained, middle-skill workers with employers, launching these workers into prosperous careers. His model is visionary, using on-the-job training to turn youth into leaders in community-driven economic development. An outspoken Latino leader, Mr. Martinez is calling out the biases and barriers perpetuating economic disparities in Latino communities and creating a regional collaboration to end them. His work is being recognized both locally and nationally, including speaking at the first White House Tech Meetup in 2015, and was named by Tech Crunch as one of 2014’s Top 10 Men in the Country Supporting Women in Technology. Since opening in 2014, Digital NEST’s youth enrollment has surpassed 2000 members and in April 2017, Digital NEST opened a second location.